It's been said that every self-respecting geek should build a MAME arcade cabinet in his/her lifetime. Well, mine is PeterCade. This sounds like a daunting job, but, nowadays, an arcade cabinet is essentially a PC in a wooden case. Quite unlike the cabinets made by the first hobbyists in the nineties; they had to make them from real commercial cabinets' components. Which meant you had to know a lot about how these cabinets were built. Also, thousands have gone before me so I have stolen learned from their ideas and mistakes. 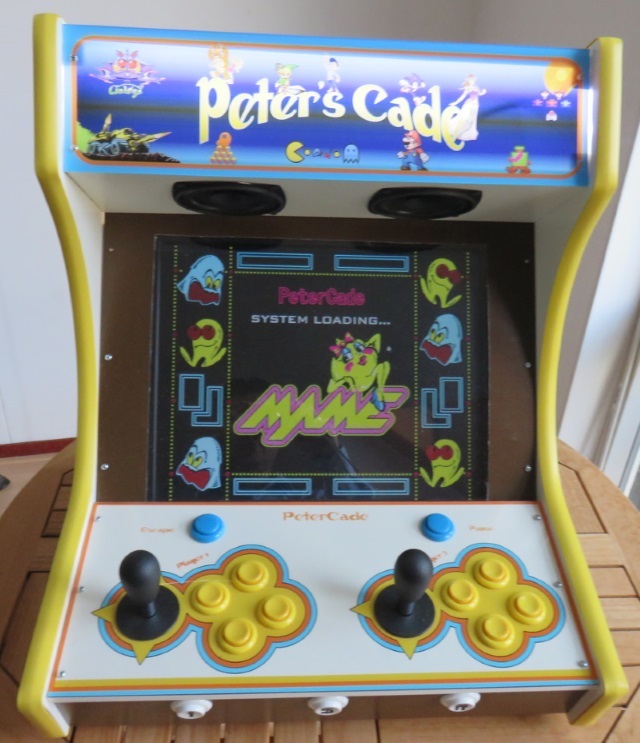 I have based the design of PeterCade on the Weecade. This is a very popular table top model and you will find many people who have built a Weecade clone. I didn't stick to all measurements precisely and have deviated here and there. For example, I didn't dare to put the internal moldings in before assembling the basic structure. USB ports In order to easily hook up keyboard, mouse, USB sticks etc I wanted some USB ports at the back. I have bought a SilverStone FP32, removed the metal casing and mounted the i/o panel at the back. Buying components for an arcade is actually not very complicated as most are readily available. More tricky are the control panel parts (buttons, joystick etc). The UK has a few dedicated (online) arcade shops and in the Netherlands I can wholeheartedly recommend the ArcadeWinkel. Plexiglas Generic 2mm Plexiglas for marquee, control panel and monitor protection. This Dutch company cut all three to size, drilled	the screw holes, joystick & button holes and painted the artwork on the marquee & control panel. They did an excellent job! The control panel is made of a piece of 450mm x 198mm x 8mm MDF and a 2mm sheet of Plexiglas. This Dutch company cut the plexi to size, printed the artwork (at the back!) and drilled the joystick, button and screw holes for me. I provided them with a transparent .PNG of my artwork. The machine-cut holes in the Plexiglas fitted perfectly with the artwork; a beautiful job. I drilled the joystick and button holes in the MDF myself and for whatever reason I couldn't get the holes lined up correctly with those of the Plexiglas. I ended up having to make some of the holes in the MDF a bit bigger, which, fortunately, can't be seen from the top because the buttons and the joystick fully cover the gaps. The joystick is screwed directly on top of the MDF, so I can't easily replace it. The alternative was to have screw holes drilled in the Plexiglas but then there would be 8 extra screw heads visible. And the risk of cutting your hand against them during gameplay. I prefer the current solution - is looks much neater. The beauty of these Mag-Stik Plus joysticks is that they dynamically can be set to 4-way or 8-way play, although it is a bit of a fiddle. I have nothing but praise for these joysticks: very precise handling and they definitely look the part. The front-buttons for coin and 1-player and 2-player I had bought initially didn't fit - they pushed against the joystick. I didn't have much choice because they were the only ones with printed coin, 1P and 2P signs. 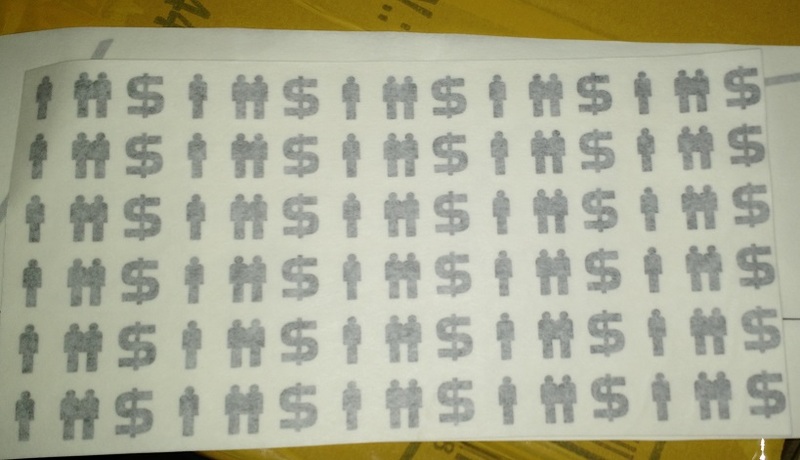 After finding a guy in the US who could print these decals for me, I bought new white buttons; they have their microswitch built in and are therefore not so high. Fortunately these buttons didn't clash with the position of the joysticks. The controller has a USB-B connector which you connect with a standard USB cable to a PC or, in this case, directly to the motherboard. It presents itself as a USB joystick controller. Another interesting snippet is that I initially wanted to paint the MDF control panel dark brown and the cabinet side panels off-white. A similar color scheme as the Weecade. However, when I put the transparent Plexiglas on top of the brown MDF panel, the artwork could hardly been seen. So, I decided to swap colors: the control panel in white and only the side panels in dark brown. Looks much better, particularly with the yellow T-molding. This part has taken me longest to figure out. I wanted to mess about with power as little as possible. And I definitely didn't want to do any kind of soldering. I have chosen to power the audio amplifier using a dedicated 12V adapter. The alternative was powering it from the motherboard using a 12V molex connector. I decided against the latter because the good people of arcadewinkel.nl advice against it - may cause static noise and humming. The LED lights were the easiest to solve. I have connected one end of a molex connector to a molex plug on the motherboard, cut off the other end and used some blade connectors (aka cable shoes) to connect to the 2 LED wires. To be precise: the yellow molex wire (carrying 12V) and one of the 2 black molex ground wires. The other 3 components are connected to the powerswitch. The cable splitter feeds the monitor and PSU. I have cut off its plug and connected the 3 wires directly to the powerswitch with blade connectors (aka cable shoes). The 12V adapter for the amplifier has its electronics built into the plug (which I shouldn't cut off) so I have bought a Europlug extension cable. I have cut off the extension cable's plug and cut the cable splitter mid-way. The 3 cables (with 3 wires each) I have connected using 3 WAGO 222 connectors. The monitor is mounted behind plexiglas and is permanently switched on. So as soon as power is applied to the power switch the monitor will turn on. In general, motherboards need to be switched on via a power button. I have used a small service button mounted on top of the arcade to turn on the motherboard. I have used a 2-pin motherboard header cable, plugged one end onto the 2 power pins on the motherboard header, cut off the other end, fitted two blade connectors (aka cable shoes) to them and connected them to the button's microswitch pins. As can be seen in some of the images, during the built I had temporarily connected a blue button to the motherboard's powerswitch. Although terrible at anything artistic, I did make the artwork myself. Or better said, I stole bits and ideas from others. Here is a PNG of the control panel and a PDF of the marquee. If you want the originals (both in powerpoint no less :-)) email me. And yes, I did make a mistake by printing Peter's Cade on the marquee; that should have been PeterCade. Apart from Windows XP, I've used MAME and MaLa (MAME front-end). I didn't really see the need to install other game emulators. The Windows XP configuration is all quite straight forward. Installing Windows XP & the motherboards drivers is the first step. Then I have tweaked Windows XP to get rid of the standard Windows UI from start until the MaLa frontend starts, see the table below. I have set the screen size to 800x600 pixels. I have used a custom built of MAME version 0.148. The only change I've made is disabling the warning startup screens which I find annoying. Other than configuring the joysticks & buttons there is nothing special you need to for MAME. If you are interested in running MAME then I assume you know what to do about game ROMS. Either way, don't contact me about where to find them - you are on your own there. After looking at alternatives I've settled on MaLa, version 1.74 for MAME's frontend.